My goal for 2014 is to spend less on food. Bummer! That’s really a lot. I know we try to eat as natural and organic as possible, but still…. After taking a much closer look at my categories, I see that we are eating out too much. I can see where I’ve made some mistakes in my purchasing groceries and I can see where we are making good choices. I quit buying yogurts and started making my own. I make our own tortillas and we often use them instead of bread. We buy our beef by the quarter from a farmer and get organic meat at a decent price. Eggs, chicken and milk come from farmers around here. We pay about the same price but get better product. We have a small garden and I try to can and dehydrate as much as possible for the winter. Get a good whole wheat bread recipe and stick to it. No more buying bread. Take advantage of the Azure Standard co-op that is in our area now. Limit our fine dining to once a month (date night only). Create a standard shopping list and compare prices between Meijer and Kroger. Make yogurt regularly and use it for sour cream as well. Make my own salad dressings. Make more snack bars so I do not need to buy snacks for Jason’s lunches. Hopefully I can come up with a few more ideas during the year. The one big thing I would like to get rid of is buying cold cereal. But I haven’t had much luck yet. Jason doesn’t feel well on many different breakfast items, and cereal stays with him the longest. Oat meal works nicely on occasion in the winter, but others times not so well. We have a Sam’s 20 minutes away and a Costco is coming soon about 40 minutes away. So I look forward to seeing what I can save there as well. 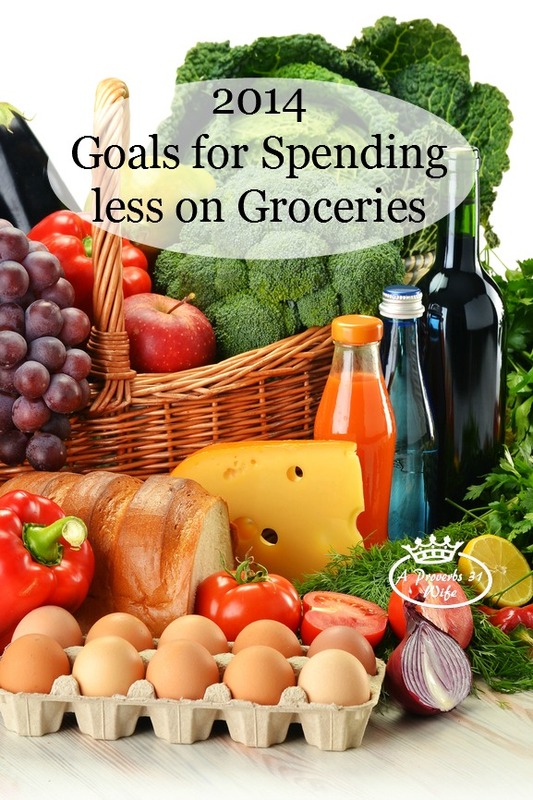 Do you have plans to spend less on food in 2014? Ah, Yes the dreaded grocery bill. As hard as we try it is a daunting thing. Azure comes to our area now!!! I didn’t know that. You might be interested in knowing there is also a Walnut Creek Food Coop (not Produce) that comes to Gettysburg once a month too. Oooh–bread recipe! Go the Kitchen Whisperer’s website, http://www.thekitchenwhisperer.net, and look for the awesomest no knead bread recipe! I found it a few weeks ago, and I am in love–it is that easy. It takes only a few ingredients, and when cooled, it slices like a dream. We have done the price comparison in the past – Aldi and Walmart are the cheapest for us. Even with kroger gas points or meijer whatever they have it’s just still cheapest for us to use Aldi and Walmart! I like what you have already done and your goals for this year are great! Not sure I could do the yogurt for sour cream – I like my sour cream pretty well! Yeah, the trick with yogurt is making sure it’s thick enough to substitute sour cream otherwise it is a bit funky. As far as Aldi, mom likes it really well, but they are out of the way for us, and we really dislike the produce at Walmart. We use plain Greek yogurt instead of sour cream and add chopped onions or chives. It’s nearly impossible to tell the difference!! Here is an AMAZING bread recipe that yields 2 loaves. I let the dough rise until 2-3x the original size and cut the dough in half. I place one half in a cast iron loaf pan to rise again and put the second set of dough in the fridge (in a large to Xlarge glass bowl); it will continue to rise. It will last for 4-6 days depending on what you store in the fridge. When you are ready take the dough out shape it with two forks and plop it into a loaf pan. Let it come to room temp and do it’s final rise. Viola! Easy-peasy and best of all, it’s No-Knead and SUPER tasty!!! FYI- this is the best cooking blog/sire I have ever seen. I make her dishes 3-4 times per week. It’s changed our lives and my kitchen. I make my own pizza from scratch… pretty much everything from scratch nowadays. I saw you mentioned Kroger and Meijer. I am from Michigan, spent most of my life there, but relocated to SD almost 4 yrs ago. I miss those two stores greatly! We stopped buying cold breakfast cereal last year. I make whole wheat butterhorns, mini stratas or quiches made in muffin tins, make ahead french toast sticks, etc. for breakfast. They take a little time to prepare beforehand, but they’re easy to heat in the morning. Surprisingly, they’re affordable. The idea of quiches in muffin tins makes sense though and we love quiche! Actually, my husband does the grocery shopping, and he only buys things when they are on sale, other than the staples, which he gets at Costco. As far as eating out, we VERY rarely eat out. I’m talking, maybe once every 3 – 4 months. And when I say eating out, I don’t mean, once ever 3 – 4 months, but we stop by a fast food place a couple of times a week. I mean once every 3 – 4 months period. We usually don’t eating anywhere but in our house, or someone else’s house. One thing we started asking for a couple of years ago, is gift certificates to restaurants that we would normally go to on our own. Works like a charm, and it gives us free date nights! By the way, thanks so much for the Christmas card for being one of your Lilla Rose customers! I just received it in the mail yesterday. And don’t worry about my getting it late. I just thought it was really sweet to get it at all! Thank you for sharing. I sat down one night and wrote down everytime we ate out, got drinks out or snacks out. I was so shocked with how much we sent. way more then what I thought. I have been trying to start saving more on groices. We kicked the cereal habit with homemade granola, oatmeal, frozen (homemade) breakfast sandwiches and breakfast pizzas (along with some of the other ideas already mentioned). I also have been known to make lots of sausage patties and freeze them so we can pull them out and warm them up quickly too. Breakfast is much easier to master when you are home and not rushing out to work! Kendra, did you update this for 2015? I try each year to spend less than the year before. As prices continue to rise, each year gets more challenging. Each year, I learn and develop a habit of making something new from scratch. It’s not easy, but it works. I make all of my own breads, tortillas, snacks, desserts, etc. We only eat out if we are traveling or maybe once or twice a year for a birthday or anniversary. We don’t have fast food where we live so there is little temptation there. Keep up the great work! Thanks for sharing your tips with us. I can completely relate. When I lived in the city, it was a struggle more days than not. My grocery goals for 2015 are to make more “convenience foods” rather than purchasing them. That means no bread, tortillas, english muffins, cereal, crackers, frozen pizza, etc. I haven’t been perfect, but I am trying to reduce it at least. It’s not always easy, but it saves a ton of money.